Peter Carrels' "Uphill Against Water: The Great Dakota Water War" is a shocking story of how bureaucracy destroyed rural economies and indigenous people, all in the name of progress. University of Colorado Law School lecture series on "Hot Topics in Natural Resources" April 16 and May 4 on the Boulder campus. Montana Audubon annual meeting will focus on "Preserving Our Rural Landscape," April 23-25, in Helena. Primate expert Dr. Jane Goodall speaks on "Chimpanzees: So like us," April 27 in Jackson Hole, Wyo. Arkansas River Basin Water Forum, "A River of Dreams and Realities," will be held April 23-24 in Canon City, Colo.
Desert wildlands activists will discuss grazing reform at the 21st annual Desert Conference, April 29-May 2, in southeastern Oregon. The High Desert Museum calls for nominations for the 1999 Earle A. Chiles Award for thoughtful management of natural and cultural resources of the High Desert. 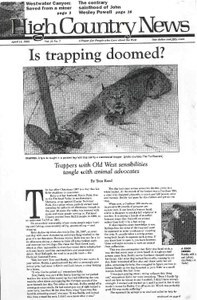 Wyoming Wildlife Federation's 53rd annual meeting will be held May 15-16 in Story, Wyo. Colorado College hosts a debate about draining Lake Powell, April 21, in Colorado Springs, Colo.
"Travelers in an Antique Land" pairs poetry by William Studebaker with photographs by Russell Hepworth. Speed limits return to Mont. ; chic camouflage; salmon too pooped to procreate; coyote killed by snowmobile in Idaho; prairie dogs are pets in Japan; Dave Barry and DIA; Utah's Burr Trail; bivy sack controversy in "Mountaineers"; hand cannon at gun show. Trash patrol; Elizabeth Manning and Westwater Canyon; visitors; corrections. Rafters and environmentalists rejoice because the federal government orders the removal of Ron Pene's controversial gold mine in Utah's Westwater Canyon. The controversial Battle Mountain gold mine in Okanogan, Wash., is denied a plan of operations because - ironically - the mine fails to meet the requirements of the 1872 Mining Law. An international environmental commission joins the debate on how to protect the San Pedro River in southern Arizona, where rapid growth has increased the pressure on the desert river. The Idaho Conservation League is furious because a pro-timber industry group has set up a Web site with a very similar name and an opposing message. Dallas lawyer Thomas A. Fry III is appointed acting director of BLM. The Waste Isolation Pilot Plant outside Carlsbad, N.M., receives its first truckload of nuclear debris as anti-nuclear activists continue to protest. The Yellowstone River is still the longest undammed river in the Lower 48, but miles of riprap on its banks lock the river into a channel that is more a rain gutter than a free-flowing river.